The Healthy People 2010 objectives aim for at least 75 percent of Americans to eat the recommended two or more daily servings of fruit, and for at least 50 percent of Americans to eat the recommended three or more servings of vegetables daily. However, CDC surveys indicate that only 33 percent of adults meet the recommendation for fruit consumption and 27 percent get the recommended servings of vegetables. The statistics are even worse for high school students – 32 percent report eating at least two servings of fruit daily and 13 percent say they eat at least three servings of vegetables each day. The CDC apparently measured fruit and vegetable consumption by state and not a single state met the recommendations of 2 servings of fruit and 3 servings of vegetables…they set the bar really low (i.e. 5 servings total & they weren’t even looking for 100% compliance) and the results are frankly, pathetic. I don’t know if they counted potatoes & corn in the figures above ~ I hope not. I think we tend to think of a dinner plate as including a protein (meat, fish, poultry), a starch (rice, potato, pasta) and (maybe) a vegetable. Maybe we need to eliminate the starch more often and load up double on the veggies. Why can’t a plate look like protein, veggie, veggie or maybe protein, veggie, fruit (I know a potato is a vegetable, but it should be categorized separately when counting vegetables). Some of the blame should certainly be shouldered by the government and their dietary recommendations, which they keep trying to make clearer by changing the “food pyramid” graphics (without much success). I talked about the latest iteration, the government food plate, which pictures a plate composed of about 1/3 protein, 1/3 fruit, 2/3 veggies and 2/3 grains…and a side of “dairy.” I critiqued this in a previous post here and also shared some better guidelines from Precision Nutrition here. The Precision Nutrition recommendations vary depending on whether you have exercised that day or not, but in a nutshell, they emphasize protein and veggies…grains/starches and fruits are limited in quantity and reserved for workout days only ~ dairy does not have its own category. I don’t really know why we have so much trouble with the vegetable category. Maybe we are just uninspired and think of veggies as a package of frozen peas, or if we’re really feeling adventuresome, maybe one of those frozen vegetable medleys. But vegetables can be so much more than that. To prove my point, and to hopefully fill you with some excitement and inspiration, I am sharing some recipes, all ones I have tested (I did a marathon session in my kitchen today for all of you, so that I could try things out and take some photos ~ you’re welcome). So without further ado, let’s get started. I have posted recipes before, so I am going to start by linking to some previous recipes for those of you who may have missed them. 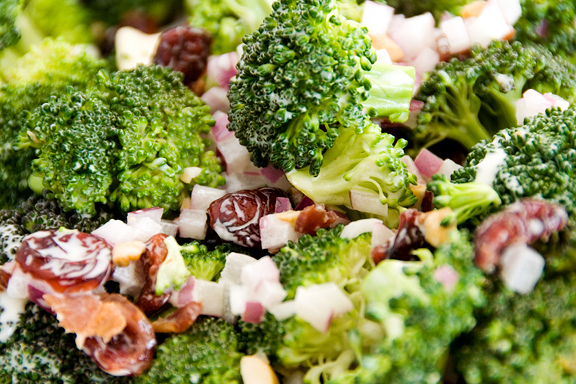 Broccoli: Bacon Broccoli Salad is a favorite of mine from the Primal Blueprint Cookbook. I especially like this recipe because it uses raw broccoli, fruit (I use blueberries ~ don’t knock it until you try it) and bacon. Really, what doesn’t taste good with a little bit of added bacon (just be sure to choose a good quality bacon that doesn’t contain nitrites or nitrates…I use Applegate). Another great recipe using broccoli, from Gourmet Nutrition is Pesto Chicken Pizza, which calls for not only broccoli but also asparagus (this is so good I have made it twice in the past few months, once for company). Swiss Chard: Again from the Primal Blueprint Cookbook (LOVE this cookbook, highly recommend it) is Swiss Chard Frittata. This can be great for a meal, as it includes lots of protein from the eggs…sausage can be added to make it even heartier. Reheats well. Zucchini: Stuffed Zucchini, also from Gourmet Nutrition. This recipe takes a bit more work as you have to scrape out the zucchini, leaving just the shell, then stuff it with a mixture of zucchini, mushrooms, onions and nuts. Worth the effort. Sweet Potatoes: This recipe, Coconut Oil Roasted Sweet Potatoes, goes back to one of my very first posts. If you think that coconut oil (a saturated fat) is bad for you, you might want to go back and read here. Spinach: This also goes back to an older post titled “Three Quick and Easy Ways to Use Spinach.” In the post I discuss adding spinach to your eggs and to a smoothie and I also provide a recipe for Spinach Sautéed with Raisins and Pine Nuts. Beets: First up I have a previously posted recipe called Farro Salad with Beets, Beet Greens and Feta. I make this one a lot in the summer when I get a plethora of beets from my CSA. It is a great cold salad that uses not only the beets, but also the super nutritious beet greens. Today I tried a new beet recipe that I found in one of my Jamie Oliver cookbooks, The Naked Chef Takes Off. This very simple recipe, Baked Beets with Balsamic Vinegar, Marjoram and Garlic, tastes heavenly. Containing only 5 ingredients, it all gets thrown together in foil to roast in the oven (the photo to the right is before this went into the oven). Green Beans: I have two recipes for you here, one using green beans as a side, one as part of a main course salad. Green Beans Provencal is from The New Basics Cookbook (which isn’t very new anymore…mine has a copyright date of 1989 ~ yet it is still in print!). This yummy side includes tomatoes, nicoise olives and some white wine. Mmmmm….. The second recipe is Chicken Salad with Green Beans and Toasted Walnuts. This is a recipe I have had forever…I think it might have come from Bon Apetit many moons ago. This is a very simple preparation that relies on mint for a bit of the unexpected ~ it lends a very fresh taste to the salad, which can be served warm, room temperature or cold (I like it room temperature). Cauliflower: I am having a love affair lately with cauliflower. I actually love it so much and find it so versatile that I have a separate blog post planned for it. However, today I am going to share a very simple preparation idea that I got from my friends Jeanne and Tamara. I’m not even going to type this up as a recipe, it’s that simple. Just wash your cauliflower and break it into similar sized pieces (I cut the really large florets into smaller pieces). Toss into a ziploc bag and add olive oil or melted coconut oil, salt, pepper and a touch of brown sugar. Do not be tempted to overdo this ~ I would say maybe a teaspoon or two at most for a head of cauliflower. Close the ziploc bag and mix everything together until the cauliflower is coated with the ingredients. Dump into a roasting/baking pan and roast at 375 degrees until cauliflower is tender. I could not stop eating this! Brussel Sprouts: I have to admit that I never, ever had a brussels sprout until I was on vacation last month…seriously. But I’m guessing I might not be the only one who has avoided them. However one morning for breakfast the hotel offered an egg dish with a hash that included brussels sprouts. It was delicious! So I looked for a recipe similar to the breakfast hash dish, and found this one for Bacon and Brussels Sprouts Hash (above, cooking on the stove, and below, the finished product). I just made this today and I have to admit it turned out pretty well. I think this would be equally as nice as a side dish or as a main course with an egg or two on top for some protein (similar to my breakfast at the Bardessono). In fact, that is what I had for dinner last night…highly recommend it! A few comments about the recipe ~ first, I cut it in half and it still makes a lot. Second, I would eyeball the proportion of potatoes to brussels spouts to whatever suits you. I followed the recipe and feel it is a bit heavy on potatoes…I would reduce the potatoes or increase the brussels sprouts in the future. I did not have pearl onions on hand…I just used a regular onion. And I didn’t have fresh thyme ~ instead I just used a teaspoon of dried. Are you feeling inspired? I think to make veggies a more central part of your diet you need to actually put some effort into their preparation. Honestly, most of these recipes are very simple, but it’s amazing what a little bit of garlic, an herb or a few other ingredients can do for a dish. It is important to mix up the kinds of vegetables you eat. It’s easy to get caught in a rut and always do the same thing (steamed broccoli anyone?). There are so many different vegetables out there ~ realize how lucky we are to have so much variety and quality of produce available at our fingertips. Take advantage of it…your body will love you! This entry was posted in Nutrition and tagged Beets, broccoli, brussel sprout hash, cauliflower, Government Food Plate, green beans, Precision Nutrition, spinach, swiss chard, vegetables, zucchini. Bookmark the permalink. 5 Responses to Eat Your Veggies! Ahhh……another great blog, Lisa! I have a drawer full of tube beets that I had planned to slice and roast into beet chips. I will now use half for the beets/green/feta and the other half for the beet marjoram recipe. Keep the inspiring words flowing! Thanks, Brenda. I’m having some of the beets with marjoram for lunch! I love these recipes Lisa. Thanks for the Bacon Broccoli Salad recipe. It’s very similar to a salad I’ve purchased at Whole Foods that I adore. I have seen a similar style recipe in the past, but I like this one that adds apples or blueberries in lieu of the more traditional raisins. My husband’s Dutch falimy make something like this call hutspah . I know that isn’t correct but phonetically, it is close. Come to think of it, it doesn’t sound Dutch at all, but nonetheless, the combination is right on. I would love to post more recipes but I don’t have the patience to photograph each step lazy? Yeppers!Keep the recipes coming!